Check out the winners of Saturday’s ATTACK OF THE GIANT CARD!! Tournament! Jordan Sanchez from Albuquerque, New Mexico used his Danger! 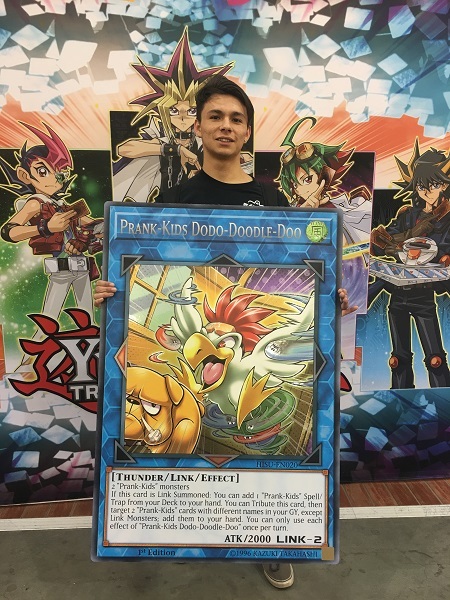 Gouki Deck to earn first place and take home a GIANT Prank-Kids Dodo-Doodle-Doo. 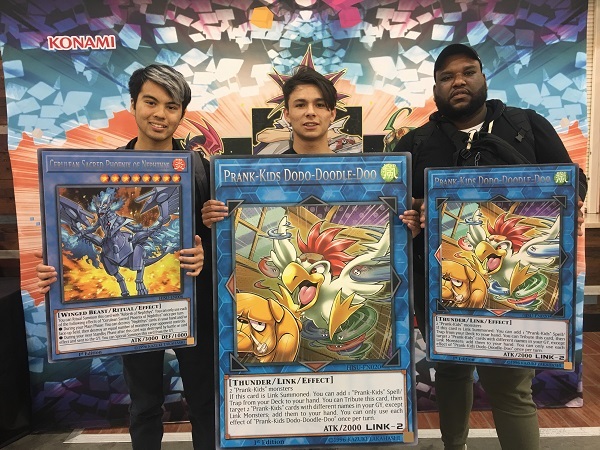 Joining him in the winner’s circle are runner-up Brian Batista from Boston, Massachusetts with his Sky Strikers and third-place Duelist Sebastian Rivera Pon from Berkley, California with his Mermails. Batista chose to take home an oversized Prank-Kids Dodo-Doodle-Doo, while Rivera Pon opted for the oversized Cerulean Sacred Phoenix of Nephthys. YCS Pasadena: Saturday’s Top 4 Dragon Duelists! UDS Champions at YCS Pasadena!